The title is a misnomer, because I won’t see Christmas in Anchorage. I’m one of those snowbirds that leaves town, preferably at the first drop of snow. A later departure this year, I can report on what’s happening in Anchorage this month. As in other cities across USA, the parties are at every corner and every day. Last night was one of the best, as a local civil engineering company, PND, sponsored a great feast at the Petroleum Club. Dennis always tries to outdo the other sponsors, and succeed, he does. They served ‘bottomless’ wine, wild boar, elk, shrimp and King Crab legs. Of course, all the usual sides, like brie, fruits, desserts and such. Even better than the food and drink selection was the friends and conversation. So this writer will be on holiday leaving good memories behind. Yesterday's local newspaper reported a kind of sad travesty. It seems the ski slopes are not attracting the young people like they used to. Perhaps it's because we're in the electronic era, where computer games and Wii are providing enough entertainment and exercise to satisfy our youth. It's okay for a senior citizen to become more sedentary, but surely the adolescents need to get outdoors and enjoy winter. I can remember skiing in the zero temperatures and thinking, oh, it hurts so good. Those days are gone. Also, I note that the schools seem to pile on more homework these days. I don't know that 'more' means 'better' because the test score are not rising at a comparable rate. So this ends my lecture, on which I could continue, but let's just think of the happy days of Christmas break. . . and a Happy New Year's, too! November has flown by, and that's okay with me because I'm leaving the state for a month. The beautiful white snow doesn't seem as good as it used to because I'm not skiing these day, nor doing much outdoors at all. Swimming is still going great, but then you can swim anywhere. There's a lot on the front burner, but the big thing was doing some turkey dinners along the way. I had three or four turkey dinners at varius places, but the most memorable one was at the beautiful Millenium Hotel. I had a piano gig there, so spent the whole day watching the families, and couples, and strays attend. This is a truly Alaskan Hotel, and I would recommend it to anyone who wants to see the 'real' Alaska. The lobby has mounted heads of all the wild animals, and the setting includes a huge stone fireplace, and adjacent bar which overlooks Lake Hood. For those who haven't visited Anchorage yet, this is right at the airport, and there are planes on floats, or now skiis, lining the perimeter. From the hotel restaurant, you might see a plane land on the lake and taxi up to the restaurant for a quick bite. This may sound a bit like a commercial, but then, I'm trying to lure you up here for a visit. Black Friday was its usual confusion, as it was all over the country. Well, we survived that one, and now on to Christmas in Florida. Alaska Survives the Election & Sarah Palin, too! I'm sure you're as happy as I am that the election is over, regardless of the results. Sparing you any images, Alaska have probably re-elected Senator Stevens, in spite of him being accused of being a felon. Most locals agree that if the trial had been held in Anchorage, he would have been acquitted without question, as it's the "Alaska Way" to help your neighbors, and his only crime was that he didn't report it on the financial statement. But I won't go further into that. 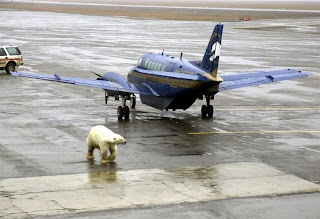 This morning, the local news shows the Governor deplaning in Anchorage, to return to her main job, raising her family in Wasilla, and her secondary job, running the big state and promoting our oil and gas reserves. This might be better served is she were closer to the capital (where???) which is a 2 hour plane ride away, but here I am giving opinions, and that's really not my intention. So let's get back to your inspiration to visit Alaska. I really thought I had written a blog about our new convention center, called Dena'ina Center. My webpage would direct you to my other blog, where I know it's displayed, but this is to report that it's filled the month of November with many Christmas bazaars, art shows, events, and has turned out to be a real draw to go downtown. Locals have been avoiding going downtown for the past few years, during the total construction of all the roads and buildings, but as winter approaches, things are smoothed out and the heated sidewalks on F Street are a welcome addition. There is also a new parking garage on F Street, making things more reachable. Thank heavens -- we've needed this for a long time. We're just getting to be a big city, and kind of pretty, too! If you want to see the real Alaska, fly to Baranof Island and you'll see . . . Sitka, the first Russian Capital of our Great State. When you land, it's the same feeling as landing on water, because you're surrounded by lots of water, and islands interspersed. Sitka is located on the West Side of this Baranof Island, making it a long detour for the cruise ships, who normally dock there only on the southbound route from Haines and Juneau. There is no deep water dock, so passengers have to be lightered in to a delightful 'tourist area'. Each year the season extends a little longer, so we found tourists there on September 20, which is pretty late in the year. Normally, the first stop is Centennial Hall, where they have the Archangel Dancers, who are a group of local women, some playing the men's role, of Russian dancers. The narrator is costumed in beautiful Russian dress and tiara. This weekend, the Pioneers of Alaska were having their state convention there, so the dancers were bumped. This was the reason I was in Sitka -- as we Pioneers are a group of older people who have been preserving the history of Alaska for 100 yrs. In fact, last year's tour in Nome celebrated "100 years on the Trail" . . . and most of them have stories to tell. It makes my 42 yrs. here seem like I'm a newcomer. One of the highlights of the convention is Banquet Night, where the ladies dress in old time costumes, and the men look like riverboat gamblers. Imagine stuffing all those puffed sleeves into your allotted suitcase space. Well, I wish I had some images of this to show you, but suffice to way, it was a lovely get-together with a mix of business and pleasure. I never leave Alaska for too long, or without a good reason, but I thought the Texas Association of Magicians Convention was worthy of a trip to the hot climate for a week. . . and especially since it was honoring a friend of mine, and a friend of magic, Walter Zaney Blaney. 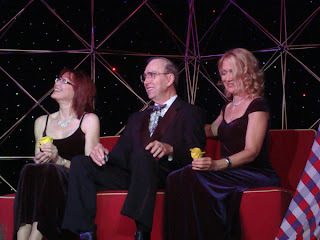 You see him here pictured with two of his 3 daughters, Becky and Carol. Walter has spend 60 of his 80 years in magic, both performing, and inventing props. In the field, he is well known for his levitation and suspension props, as well as performing around the world with his late wife, Joyce. I was concerned with the heat of the area, but we got the edge of hurricane Gustav there and the rain cooled things down, just when I couldn't take any more heat outdoors. However, the Renaissance Worthington Hotel was first-class, and there was no reason to leave, with magic performances all day long, plus a great dealer room. After three days of this, with each show better than the last one, I retreated to a long time friend's home in nearby Dallas, and spent another three days doing the usual 'girl' things, like shopping, eating, visiting, sightseeing. Of course, with the big news coming out of Alaska about our governor being selected as the vice presidential candidate for the Republicans, I spent plenty of time in front of the television set. That was all the big news there, as well as here in Alaska, with most of the people I talked to, being favorably impressed. But this is NOT a political blog, so I'll just close out right here!!! Start building. . . dodge the raindrops . . . gather the wildlife for the ark, because the rains just won't stop. . . . the tourist numbers are down, perhaps because of the rising fuel prices, and other pricing. . . so many things seem to have failed this summer. Our Anchorage Bucs (.com) baseball team has been a real disappointment, as they just can't get it together. Right now, they're at the bottom of the Alaska Baseball League, and there are only 3 games left . .. that is, if the rains don't cancel them out. Downtown Anchorage has been a real disaster, as it seems the current mayor wants to totally re-do the streets at the same time. . . most residents, like myself, avoid going down this summer. They even had to change the routing of the Fourth of July parade to find a street that was open, and there were were very few participants . . . one float . .. one rag-tag band . . . a few military things. I won't even get into politics, because this isn't that kind of a blog, but rest assured, that would fit into the summer doldrums. The golf tournaments have been played in the rain . . tennis tournaments cancelled, or moved indoors, baseball gets half a game played before it's called. I'm not kidding you. I've lived here 42 years, and this is the summer to forget. Let's hope next summer gets us back on track. I'm ready. Wyonna and Naomi Judd visited Anchorage yesterday. They did a show at Elmendorf AFB, drawing a crowd of over 10,000. It was also telecast locally, and it was well received. One of the highlights of the program was when they called some military families to the stage, and they had TV access with their loved ones who were on the screen in Iraq. It brought tears to your eyes, and to Wyonna's, too. After the 2 1/2 hour show, they had a huge bonfire on the tarmack - how do you spell that? I know - go to spellcheck. Anyhow, it was a great send-off for the Military "Thunder" weekend. The Thunderbirds are putting on their airshow today, and tomorrow, too. This is all in conjunction with the 50th anniversary of statehood for Alaska. There's always a heap of activity this time of year, and the visitors are abundant on the downtown streets. The baseball season continues, and the Bucs are near the top of the heap. So much for an inkling of reasons to visit Alaska! When you visit Homer, you will find a different world down there. This is primarily a fishing village, but also a quality art community, too, as the Arts are thriving. There are two lovely galleries there, The Pratt Museum, and Bunnell Art Gallery, plus a multitude of shops ranging from the popular Wild Berry Products, to Cups, a restaurant which has broken pieces of cups lining the walls. This is the statewide logo for Made In Alaska, and I think it's so clever the way they have nested the mama bear and baby bear. Besides the hospitality of the locals, I was also privileged to attend a barbecue party at the home of a UAA Music Professor. She had a 3 piece jazz combo playing in her living room, and they were all professionals, but the real great was a visit for a former vocalist who can belt out a song like no other. So it was a memorable few days in Homer. The flight from Anchorage to Homer is only a half hour, but it is also a beautiful drive. That take over four hours, and the road is very good, except if there's an accident. That could hold you up for hours. But the scenery is like no other. There are some interesting places along the way to visit, like Hope, Alaska, and Moose Pass. You would enjoy this side trip to the Kenai Peninsula. I've been listening to Sir Elton for over 30 years now, and he's been acceptable but no big deal. However, last night I saw this musician in action, as he did his first (of two) shows in Anchorage. 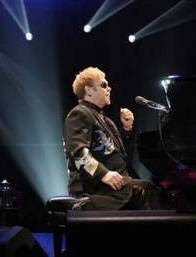 The large arena where he played to a sold-out audience, is hardly noted for its acoustics, so I wasn't expecting much, when I accepted the invitation of friends to join them in the first row. Well, I was wrong . . . this was a great show as he played to the masses, and he really knew how to work the crowd of all ages. Some near us were decked out in boas, and funny eyeglasses, etc. to join the feel of this quirky guy, and he started off with "Your Song". He finished non-stop almost 3 hours later with "Crocodile Rock", the crowd of all ages (ahem!) were mesmerized. So now I've taken in by the ultimate international entertainer. 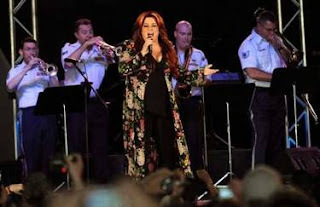 As a bonus, he did strut around the stage, wearing his "Music Magic" ornate coat, throwing kisses to the audience and waves, and at one point even signed autographs for several people who raced to the stage after what I thought was the end of the evening. It wasn't. He added "Don't Let the Sun Go Down on Me" and "Benny and the Jets" and it seemed like he just couldn't stop playing. Kudos to the lighting techies, as the light show behind the stage, about 40 ft. high also added a lot to this one-man show. I don't know about him, but today, I'm still exhausted as I felt I was working right along with him. If you get a chance, spend your life savings and go see him when he comes to your town. 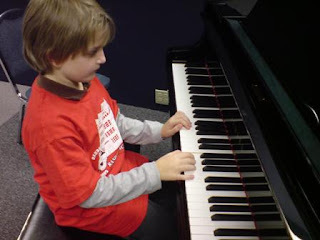 Although this isn't one of my piano students, I thought I'd share this shot of a relative . . . ahem . . . my students did a non-recital at the Pioneer Home recently in conjunction with the Strawberry Festival, an annual event put on by the Women's Igloo of the Pioneers of Alaska. This relieves stress level. Memorial Day was lovely as we had a ceremony at the downtown cemetery at the Pioneer Tract, followed by a mug-up at the Pioneer Hall. In case you wonder what all I'm talking about, the Pioneers of Alaska have been 'one hundred years on the trai' which started in Nome, and there are chapters, called Igloos, all over the state. .. this year, I'm the chaplain of our Igloo, so that's how come I did the prayers. Somehow, I also ended up as the moderator of the Presbyterian Woman, who chose to have their 3 day Synod meeting in Anchorage at the same time. So you can see that I'm glad this weekend is over. Somehow, two of my blogs were not posted, and I'm searching to find out just why. You'd think I'd have this thing licked by now. What would happen if Barbie came to life and got married? 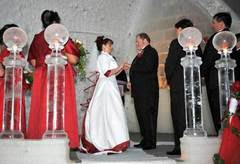 Oh, and she lived in Alaska and wanted a unique wedding. And she liked the idea of being a princess. Her big day would look just like Anchorage residents Mechelle Sharp and Shawn Boquist's wedding April 26 at Chena Hot Springs Resort. "I'm the girl playing with Barbie all her life," said Mechelle, who still has 300 of them tucked away in a trunk. 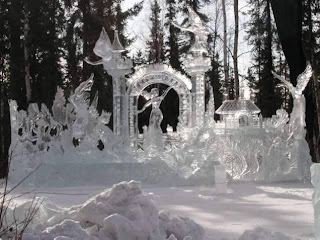 "I'm just really grateful that there is an ice castle in Alaska." Outside of all that, this was a weekend to focus on the 'kids'. My piano students played some neat music for the residents of the Pioneer Home on Saturday for the Strawberry Festival, an annual event sponsored by the Pioneers of Alaska. . . Women's Igloo #4 . . . and the Children's School of Dance gave a great performance of the "Wizard of Oz" at West High school, with over a hundred kiddies on stage together, and no one ran into each other. I am amazed over the number of 4 - 7 yr olds. who participated, wearing great costumes, and of course, there are always a few who don't 'join the group' and wander off, but they were ably grabbed by some teen age girls who herded them back to the 'chorus line'. It was such fun to watch, and brought a tear to my eye as I was laughing at the same time. Kudos to the teachers/director. Outside activities of the weekend included a women's triathalon that drew a number of the younger set of ably fit gals, and the newspaper gave good coverage of this event. This is really a running city, and in the winter, a cross-country skiing draw for national and international competitors. Until next time, keep planning your trip to big A! You'll love it here. That's the name of our local football team in case you're wondering, and last night I attended my first game at the Sullivan Arena. The IFL (Intense Football League) was founded in 2003, and Anchorage has one of the three (of 9) teams located outside Texas. Since they play in a smaller stadium, it is more personal, and I feel particularly involved since the Petroleum Club recently had their 2nd meet-and-greet. I won four tickets at this event, which motivated me at attend a game, now in it's second year. By the way, the team colors are maroon and gold, but I couldn't duplicate it on the blog, so just trying to get close. The parking lot was pretty full when I arrived, and there were several tailgate parties going on. The playing field is only 50 yards, but I felt the biggest problem was the sidelines which have boards (not unlike hockey) only a foot out-of-bounds, and the players frequently hit them hard and climb over into the attendees. There are just 8 players on a team, and sometimes it seems crowded out there. The cheerleaders were quite outstanding. Of course, they're good looking and well costumed, but their dances/cheers were obviously well rehearsed and real crowd pleasers. The opponents were the San Angelo Stampede Express and lost pretty bad... but it was good entertainment, nonetheless, and a great way to spend the evening. I've been back for a week now, but would you believe I couldn't seem to log on . .. now I love Google, but sometimes it doesn't love me. 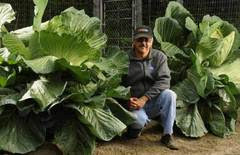 . . so I switch over to my more commercial blog, which is alaskab4udie.wordpress.com . . . I stole that name from a rather famous vanity license plate, but don't seem to worry about copyrights online. . . well, not yet. I really want to promote inbound travel to Alaska, and I try to stay focused on this. 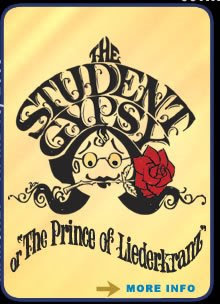 I do want to share a clever program of The Student Gypsy, I attended in San Francisco. . . .like it? One of the highlights of my trip outside was my stopover in Tacoma to visit a longtime friend. We went to the great daffodil parade, but I don't have any images of that. 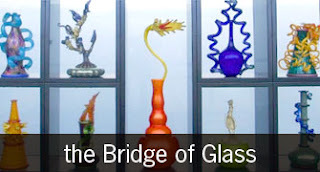 However, this image is taken from the Glass Museum, which is a Dale Chuhuly project. Dale started teaching glass blowing and glass art at Pilchuck, a small place north of Mt. Vernon, and has some impressive work, plus the work of his students. This is taken from the brochure. Enjoy. 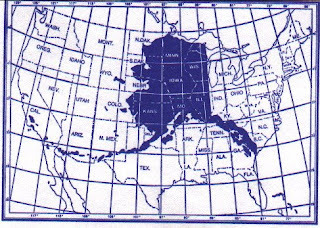 I love this map, as it really shows how vast Alaska is. A trip anywhere in the state in always exciting, and this year, I've had meetings to attend in Fairbanks, Nome, and Sitka so far. I usually get to Juneau and Ketchkan, and they're all a long way. I don't have a favorite spot, but I like my home in Anchorage as I'm only 3 miles from the big International Airport, and 2 miles to downtown, so everything is reachable in a few minutes time. However, I am leaving the state for a few weeks to attend some meetings in California. No, it's not to play poker, altho' as a magician, I frequent all the magic stores and clubs along the way. So I'm putting this card on the blog as a reminder of my magic hobby. I'll try to post sometime on the way. It's been said that there are two seasons in Alaska, winter and construction. We're in the latter one now, altho' there has been some construction going on all winter. The image on your left is an almost-finished church going up on Fireweed Lane, within a mile of my condo. I drive by it daily and for a long time I wondered, like everyone else, what it was going to turn into . .. a church of some non-traditional religion. I don't plan on entering it any time soon. Downtown is so full of building, annexing, remodeling that driving is not pleasant, and it's getting harder to park on the street anymore. That used to be one of the pleasures of Anchorage as you could just drive downtown, put a quarter in the meter and get 20 minutes of parking. Now, if you're lucky enough to find a meter in the few parking spaces left, it'll be a quarter for 12 minutes. Fewer and fewer people drive downtown unless they really need to for the Performing Arts Center programs, and Nordstroms and Penneys, who have ignored the many shopping malls in every corner in mid-town and beyond. The weather is really turning into sunny springtime, but the temp is still not quite shirtsleeve weather. But check back, and start planning your trip to Alaska, as this summer should be a great tourist season. 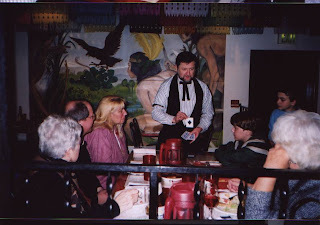 Here I am at my favorite blogspot and I find that yesterday's blog is floating somewhere in cyberspace . 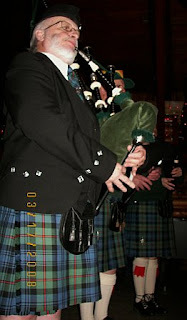 .. no matter, I just had two images on it you might enjoy -- the bagpiper from St. Patrick's day . . . yes, I know he's Scottish . . . and a polar bear which is no longer on the endangered species list. . . I'll be back . ..
1. Having the name of the Daily News arts blog change their name from "Artsnob"
2. Having the Municipality plunk some money into replacing the long time astroturf greens at our 9 hole Russian Jack golf course, so we can be accredited by USGA, and record scores for handicapping. 3. Voting for the least bad candiate for all levels. 4. Getting a group together for a wine cruise out of state. 5. Chairing the "Pioneers of Alaska" social night, called "Rockin' to the Fifties". 6. Getting some students ready for their piano recital. There's more, but I'm afraid if I go on, you'll just stop reading. . . with several good parties for St. Patrick's Day coming up, and the big Easter kids party at the Petroleum Club, and American Legion, this promises to be a good week for us locals, in spite of the ground cover. The ceremonial start for the Iditarod Races was held on March 1, 2008, down the main street of Anchorage, and winding thruout paved roads, parks, Campbell Airstrip, overpasses, etc. This is the opportunity for those with $10,000 to spare, donate this to the Committee to ride in one of the 96 musher's sleds for the first 10 miles, strictly a photo op. The 'real' take-off is from a small town about 60 miles north of here, called Willow. They moved the 'real' start further north to assure there would be enough snow after a few minimal years. You can follow the 1024-mile race online at their official website. Signaling the end of Fur Rendezvous, last night was the Miners and Trappers Ball, and I hope to get some images to post so you can see some of the great costumes. I hope you've been inspired to visit Alaska by now, and you don't have to wait for summer. Labels: they're off . . . 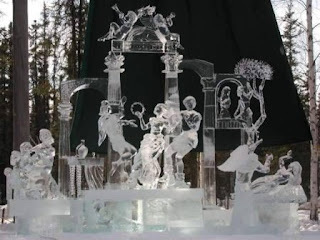 This annual event in Anchorage, Alaska, has evolved over the years. I don't even have any pictures to post at this time, so you'll have to close your eyes and imagine a little main street with piles of snow all pushed to the side, causing burms the whole distance, and dog teams racing down Fourth Avenue for a 3 day race. 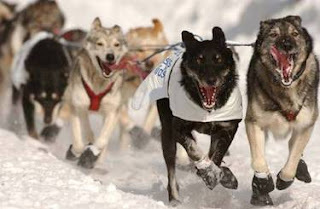 This traditional winter event almost fell thru the cracks with the advent of the Iditarod Races. Also, the gaming laws ruled out the Monte Carlo Night, which was one of the highlights, and the Fur Auction is almost gone, too. The stock car races are gone, and the Miners and Trappers Ball threatened extinction. 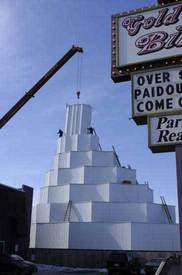 However, the city of Anchorage came thru and bailed Fur Rondy, as its now called, out, and the paper says its thriving. We'll see, because tomorrow morning is the annual Pancake Feed, held in Pioneer Hall, right downtown. 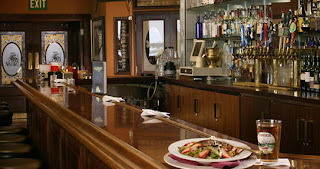 The Pioneers of Alaska are a group of older residents, as you need to be here 30 yrs. to qualify for membership. The men Pioneers do the cookin' and the lady Pioneers do the set-up, serving, etc. and they may attract well over a thousand diners. I predict that tomorrow will find a far less attendance, due to the downtown construction with road closures and lack of parking. Also, the weather has not cooperated, because after heaps of snow, there have been a few days of thawing, making everything sloppy, messy, slippery. Well, we'll see how it turns out. 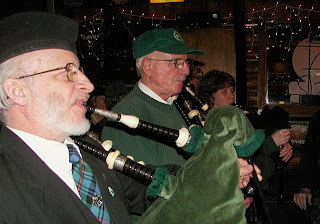 The Miners and Trappers Ball is tomorrow night, and at the same time, the Senior Center has a dinner with 4 old Alaskans telling tales of the old days. Anyhow, it's a big week in Anchorage, prior to the start of the Iditarod Races, which start on March 1st. So check back, and I promise some images! 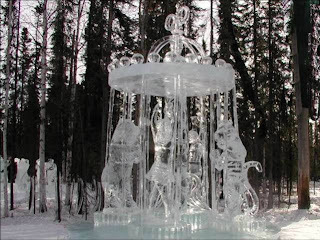 The second largest city in Alaska is Fairbanks, and some things we do in Anchorage, they outdo. 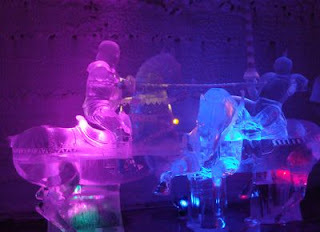 I am referring to the beautiful ice sculptures the locals carve. With the temperatures below zero, it takes a special skill because the ice will crack if you put hot water on the ice. . . and think of wearing thick warm gloves while trying to be sensitive to the shaping. You can tell I don't get involved with all this, but as a spectator, I appreciate all the labor that goes into these. I'm posting just some of my favorites, and hope you will enjoy them, too. This is a great day for lovers. . . that goes beyond people, too . . . literally, you can't love an inamimate object, so this would include trees, flowers, and computers. Let's say, I have a love/hate relationship with the latter. But you can love your dog, and he can love you back. I guess I'm resolved to that. Seeing the darling Beagle Uno, that just won the Westchester Kennel Show, you can easily see how you can love that little guy. Imagine beating out all the big showdogs and specialty breeds. Good for him. Well, this isn't too exciting a blog today because I just set up a blog for our magic circle so my clever stuff needs to go there to get some subscribers. In the meantime, hang in there with me until I get goin' again . .. There's nothing more beautiful than a drive down the Alyeska Highway, and this picture of Bird Point en route to Alyeska and beyond is the best capture I can find, stolen from the railroad, but highly recommended. The continuing route to Seward takes you some distance from the highway, thru a pristine area of mountains, lakes, and beauty. Happy touring. 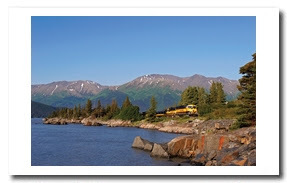 Labels: touring Alaska by rail . . . Believe it! 35 below, so what can we do to take our mind off of this chill? The Public Library started a great program called "Booklovers Gone Wild", and today the National Endowment for the Arts funded The Big Read. This was a reading of the courtroom scene from "To Kill a Mockingbird" featuring local celebrities. The theatre was full-up, and everyone enjoyed this diversion. Today is also the presidential caucuses. . . now I hope someone will comment on this misspelling ... isn't the plural "cauci" if I remember my Latin. . . and for me, the Pioneers of Alaska Igloos meet, but that's a story for another day. I've been reading a blog written up in today's paper... Shake Your Beauty which is pretty classy. However, beauty tips are secondary here to searching for ways to survive in our minus degree weather. It's the middle of the day for me, and still in the single digits. Yesterday was no different, and Anchorage hosted the Ski For Women Benefit, which didn't deter most of the entrants. This is the largest women's cross country ski race in the country I understand, and benefits women's shelters in Anchorage. 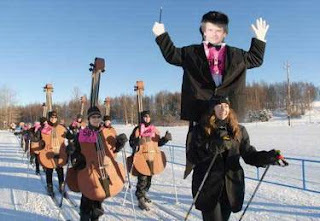 I'm posting a picture of one of the groups, honoring our Anchorage Symphony and Conductor. Each year the costumes get more elaborate. Remember this is in a typical sunny zero degree weather day. Confession: I opted to go to a Super Bowl Party at the Petroleum Club (indoors). Labels: Freezing up here . . .